The next step in processing your wine is fining. This takes place somewhere between one and five weeks after racking, depending on the kit. Your wine is in secondary fermentation during that period and we check it regularly to ensure it’s progressing as it should. During that period, sediment has accumulated once again at the bottom of the carboy. 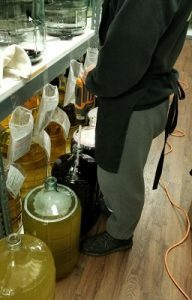 Using a siphon, we move the wine into a clean carboy, ensuring we disturb as little of the sediment as possible. Once all of the carboys have been racked, we degass each one for between 3 and 5 minutes. The degassing removes the majority of the co2. 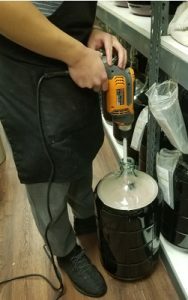 This is a slow process involving a drill, a customized mixer and a lot of patience on the part of the staff being careful not to whip the wine into a frenzy with foam spewing onto the floor. 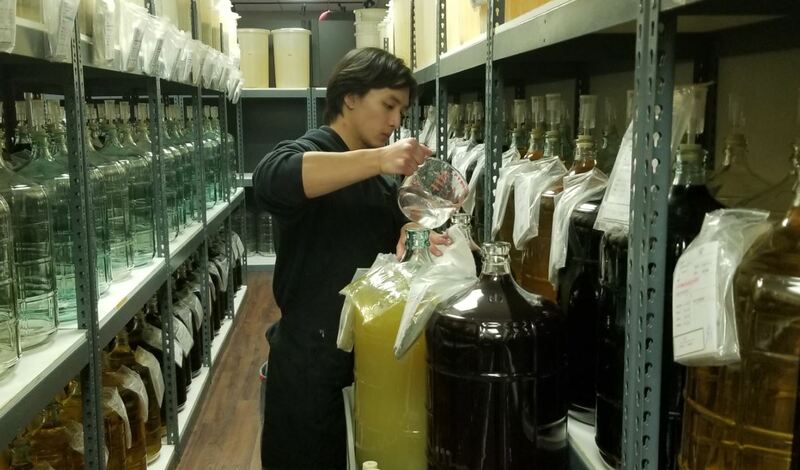 After degassing is done, Kieselsol and Chitosan are added to the carboy and manual stirring is used to mix them into the wine. These ingredients are clarifiers which stop the fermentation process and aid in clarifying the wine. For kits having additional ingredients such as flavour packs or oak chips, these are now added to the carboy. The carboys are then placed back on the shelf in the front row. This is so we can observe the clarification process closely and ensure things progress as planned. And now for the recurring theme, the cleanup. We rinse each carboy thoroughly, then subject it to a Diversol bath (mild bleach solution). After the Diversol has completed its job of sterilizing the inside (about 3 minutes), we rinse the inside of the carboy thoroughly and wash/rinse the outside by hand. We dry and cool the carboys before we put in fresh airlocks and store them on the shelves for rotation. We’re careful to follow our rotation pattern in the back room ensuring that the all of our vessels are fresh and clean. Next Months topic Crafting Your Wine Step 5 – Filtering.